There’s never been a time in my life when wolves weren’t my favorite animal. I remember looking at a book about wolves when I was little. My dad and I were sitting in the car in my grandma’s driveway, waiting for my brother to jump in. I was looking at a picture of a snarling wolf. I’d bet his teeth were as big as I was at that time. But I remember turning to my dad and proclaiming that I knew I could calm the wolf. Despite that wolf’s scary demeanor, I loved him and my 6-year-old imagination knew he would love me, too. Well, fast forward a bit. Of course, one should never approach a wolf, snarling or not, for the wolf’s safety and one’s own (although a healthy wolf hasn’t killed a human in the lower 48 states in at least hundred years, but still don’t), but my point is that I really loved wolves when I was little. And still do. So, you’ll understand the gravity of the situation when I tell you this secret: I had never heard of the Mexican gray wolf until a couple years ago. Despite having loved wolves since I was little and having been inspired to pursue an environmental career in order to protect wildlife and wild places, still, the Mexican wolf never crossed my desk. So, you’ll forgive me if I, as someone who has dedicated her career to protecting wildlife both directly and indirectly, assume that maybe you’ve never heard of the Mexican gray wolf, either. For this reason, I’m going to start from the beginning. The Mexican gray wolf (Canis lupus baileyi, also commonly referred to as the “lobo”) is the rarest and most distinct subspecies of gray wolf in the world. Nearly eradicated in the first half of the 20th century after decades of federally-funded persecution and bounty hunting, the wolf was listed, thankfully, under the Endangered Species Act in 1976. From just seven remaining individuals, the US Fish and Wildlife Service began a captive breeding program to save the species from extinction. On March 29, 1998, the first individuals were released into the wilds of southern New Mexico and Arizona. After more than 30 years of absence, the smallest subspecies of gray wolf returned home to the mountains of the Southwest. It’s been 20 years since the lobo came home. To commemorate that day in 1998, we’re celebrating this once in a lifetime anniversary. Knowing that they’re out there right this moment, doing their wolf thing, probably raising new Spring pups, gives me hope for the future of wildlife and humans. It’s been difficult for modern people to learn how to live in a natural world, but knowing that we’re collectively working toward a society that respects and honors the wolf’s place in the wild gives me hope that we’ll one day get there. But for now, let me tell you what’s currently standing in the way. At last count, the US Fish and Wildlife Service estimates there are 114 in the lobos wild. That’s not much, especially considering the 2017 estimate was 113 wolves, so their population is growing extremely slow. Human-caused mortality, which includes poaching and vehicle strikes, is their number one cause of death. And since all lobos are descended from just seven individuals, genetic diversity is also a grave concern. Experts believe that each wolf in the wild is as related to one another as sister and brother. This causes big problems like small litters and genetic abnormalities. And their ability to adapt to changing conditions is also limited, as a result. Another threat standing in the way of Mexican wolf recovery is, ironically, the US Fish and Wildlife Service’s Mexican Wolf Recovery Plan. The plan states that the delisting process for the imperiled wolf can begin when a population goal of just 320 individuals in the US and 200 in Mexico is reached- far below the 750 wolf population goal recommended by the Service’s own scientific advisory team. The plan also fails to consider the need for distinct, but connected, populations of wolves. Those same scientists suggested there be three separate populations in New Mexico and Arizona- one in the southern portion of the two states, one in the Grand Canyon area in Arizona, and another in northern New Mexico. This recommendation was largely ignored and the current plan only requires two populations, one in the US with the other in Mexico. The good news is that multiple groups, including Wildlands Network, WildEarth Guardians, New Mexico Wilderness Alliance, Western Environmental Law Center, and Western Watersheds Project, are suing the Service over the recovery plan, which they say violates the Endangered Species Act. “Yet, hope remains while company is true” (for my fellow LOTR fans). And that’s why we need you! 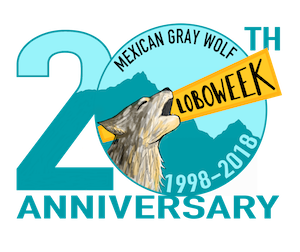 This Lobo Week, take the time to celebrate their continued recovery, educate yourself and others about their plight, and tell your decision-makers that you support the full recovery of the Mexican gray wolf to preserve our natural heritage for future generations to come! 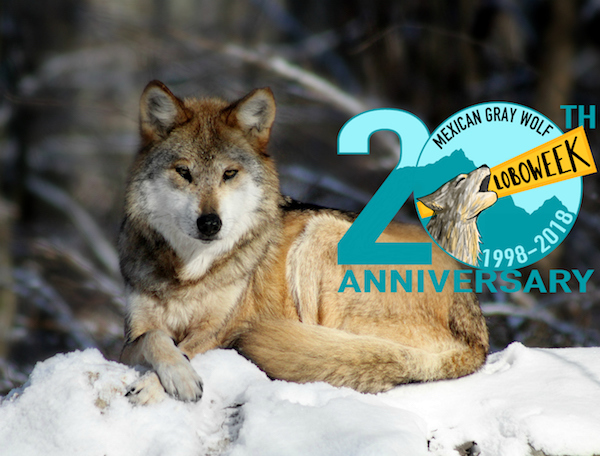 2 Comments on Because #LoboWeek: 20th Anniversary Edition!